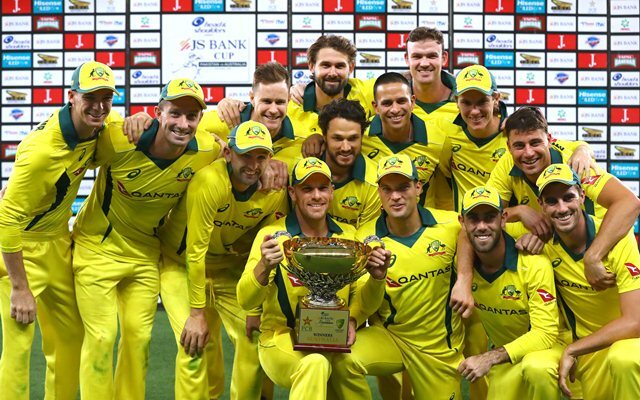 Australia finished the season on the perfect note and will be a confident unit heading into the World Cup. On the expected lines, Australia won the fifth ODI against Pakistan as well and completed the whitewash. The side put up a big total on the board batting first. Usman Khawaja and Glenn Maxwell played important knocks and put the team in a good position at the end of the first innings. With a century from Haris Sohail, Pakistan looked to be in control for a majority of the chase. However, they goofed up once Haris Sohail fell in the 41st over of the game. The batsmen failed to achieve the required run rate between 8 and 9 in the last 10 overs of the game. Thus, they fell short of the target by 20 runs. While Glenn Maxwell was the ‘Man of the Match’, Aaron Finch was adjudged ‘Man of the Series’. Australia were put in to bat first in the match. The openers, with the kind of form they are in, got the team off to a great start. Aaron Finch registered his fourth fifty-plus score in this five-match series. The skipper scored 53 before Usman Shinwari got through the gate and got him bowled. Usman Khawaja was the next to get out. He did all the hard work, was batting on 98 but failed to get to the triple digits. Shaun Marsh played a great knock yet again in the series. Even though he’s been slightly inconsistent, he finished well with a 68-ball 61. The game-changing knock, though, came from the willow of Glenn Maxwell where he raced to 70 from 30 balls. Australia didn’t finish well as they lost a flurry of wickets and got 327/7 after 50 overs. Pakistan’s Abid Ali returned to the pavilion for a golden duck in the chase. Then, Shan Masood and Haris Sohail built up a 100-run partnership. The opener got out after putting on exactly 50 runs on the board. Mohammad Rizwan failed to deliver in this match while Umar Akmal got into the 40s as usual but failed to capitalise. Sohail, however, had the belief and wanted to take his team as close as possible. Kane Richardson had other plans and dismissed him when he was on 130. The other batsmen failed to take the team through in the last 10 overs. Even though skipper Imad Wasim notched up an unbeaten half-century, his efforts fell short. Twitterati was disappointed to see Usman Khawaja miss out on his century but enjoyed the knocks from Maxwell and Sohail. They congratulated Jason Behrendorff for his three-wicket haul. 36 years ago, Pakistan batsmen scored 6 centuries in an ODI series against India with an overall series strike-rate of 101.12. I don,t know why PCB has selected such squad for #PAKvAUS series. They are just degrading the rankings of Pakistan team in ICC ODI rankings. Coming to an end, an extremely disappointing series for Pakistan. When you're beaten 5-0 in a series, you really need to go back to the drawing board. No time left in the World Cup. Consolation hundred for Haris Sohail. Quick and effective steps need to be taken.